After reading the many praises sung about the P-3AT, I decided that I have to get one. According to the Kel-Tec web site, it is available in three finishes. Which finish do you recommend and why? Hard Chrome is the best if you can find it. I have Parkerized and it is holding up fine. But I carry everyday in my pocket so I wanted something that would hold up. Time will tell how well the parkerized holds up. But the HC was my first choice. for what it is, i was'nt concerned with pocket wear on the finish. so i just picked up the first one i found. not sure what it, either blued or parked, but i'm guessing it's parked. in 6 months or so of everyday carry, the finish is showing a good bit of wear. i don't carry about that, but some might. the first thing i did was polish the chamber to a ''mirror'' shine. the top of the sights worn the finish almost from the first day, the corners and other edges are now starting to get a shine to them as well. personally, i like the worn look. Mine is blued. I've carried it every day since I got it last June in a De Santis wallet holster and it looks fine. The sharp edges at the very front and rear of the slide are the only worn areas. No big deal to me. FWIW, most P3ATs are blued, not parkerized, as the blued is the cheapest. The blued ones will wear much faster, as yours has, so I suspect it is blued. I have owned mine for about 6 months as well. And with a wipe down with a cloth and it still looks brand new. No wear, no scratches, nothing to tell it has been carried everyday at all. It's a $260.00 pocket gun that is ugly to begin with and the finish is poor at best. I really wouldn't care if it was pink with purple polka dots, (well maybe I would). I just tuck the blued gun in my pocket and never think about it. Not sure if I've ever posted this pic before? I prefer blued, as it doesn't reflect light. I know... I'm resurrecting this old thread. I recently purchased a P3AT. I took it to the range for the first time. It shot all 58 rounds just fine. I did a 50 count box of Blazer 380 FMJ and 8 rounds of Speer Gold Dot JHP mixed in. That 58 rounds was all I could stand to shoot. I have red marks and torn skin on my shooting hand. It is by no means a pleasant gun to shoot. I did not expect it to be though. I put most of the rounds into a 8 x 11 sheet of paper at 10 yards. By the end though my hand was so sore and shaking that some missed. I also think that it shoots very high. I had the "sights" lined up at 6 o'clock to shoot the bull. The shots wound up hitting in the top half of the paper. 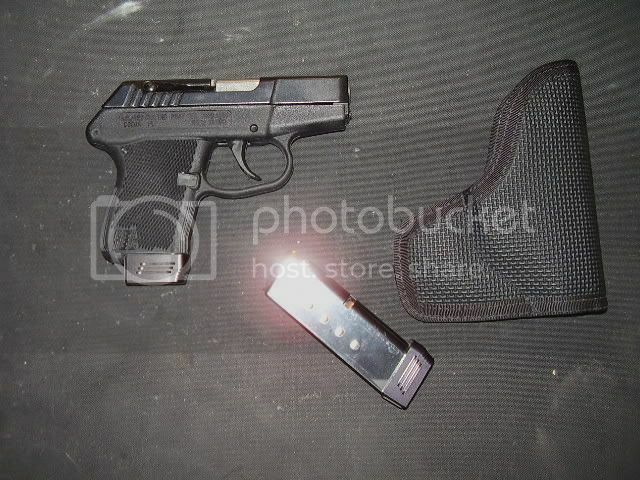 DaveM55... What kind of holster is that? Where'd you get your extended grip mags? I definitely want those. Mag extensions from Kel-Tec's web site. I installed them myself and they are a pain to install until you figure out the trick. Can you tell me the trick? Do you wax your blued guns? Flat/Blued/Checkered Mainspring Housing for 1911. How to keep Blued finish looking nice! WTS: Remington 870 Factory 2 rd Magazine Extension w/clamp, parkerized – NEW!